Students of Sci Tech Psagot high school in Karmiel joined a delegation of Jewish and Arab students, who went to the USA to promote coexistence and Israel’s image. The school was represented by three 11th-grade students, along with a student from Misgav and four Arab students from Albian College in Deir al-Asad. The delegation was accompanied by the teachers Rivka Lazarovich and Arafat Osman. This is the fourth year of the Sparks for Change project, facilitated by the Faculty of International Affairs at the Oranim Academic College, and sponsored by Jewish American donors. The project was initiated by Evertt and Janet Siegel, a Jewish father and a Christian mother, in honor of their late son Daniel: a bright medicine student who died of a brain tumor. Daniel died of this horrible disease at the age of 22, and his last will and testament was to do something beneficial for peace, and to bring about coexistence between Jews and Arabs in Israel. The trip included visits in Jewish and non-Jewish schools in three cities: Baltimore, Philadelphia, and Washington DC. 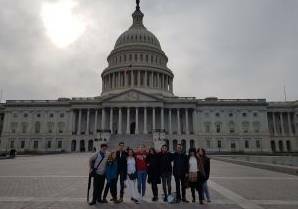 During the trip, the students met American school students. They had face-to-face conversations, as well as panels and discussion forums addressing issues such as: Jewish identity, Palestinian identity, Palestinian right of return, daily life in the Galilee, and more. Our students demonstrated knowledge and familiarity with the material, had conversations in fluent English, and tackled difficult questions. 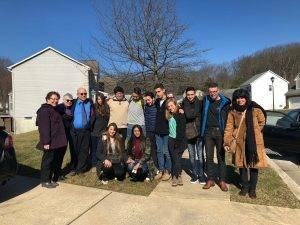 The students were hosted at the homes of American Jews, and enjoyed warm hospitality. They met some good, special people, got to know students of the same age, and experienced some unique, inspiring experiences which few people ever get to experience. The students created close friendships among themselves, and even their parents – Jews and Arabs alike – became a little bit closer. The students visited the Pikesville High Public School in Baltimore, as well as the Krieger Schechter Day School which strives to maintain Jewish prayer and faith. They also visited the Jack M. Barrack Hebrew Academy, and the Charles E. Smith Jewish Day School in Rockville, Maryland. 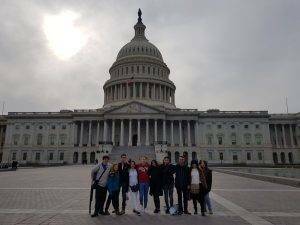 Towards the end of their Hasbara trip, the students visited some Washington DC institutions: The White House, The Capitol, The Library of Congress, and The High Court. During their visit, the students participated in the huge March for Our Lives, calling for tougher restrictions on firearm possession in the US, and received a life-lesson in democracy.